From the very beginning he was a heartbreaker. 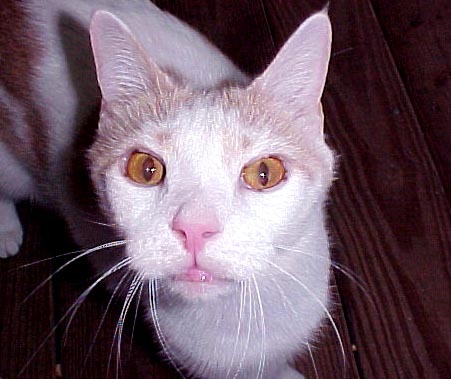 Spike's fifteen now and everyone dotes upon the old man—except maybe the young tom, Stinky. Over the years he's become quite the gourmand. I've thrown away enough cat food to prove it. What arrived at the house all those years ago looked like a refuge from a war-torn area where the people had already scavenged every available food source and overlooked him as not worth the effort. We began the process of making Spike ours from the visits to the vet for his shots, his little "male" operation, and removing his front claws. We bathed him and we cuddled him—and we fed him a whole lot. When he first found us, Spike was surviving on a diet consisting sole of crickets. He wasn't doing a very good job of that either. Once indoors and a member of our household, he fell in love with what was served up—dry cat food. He ate well and prodigiously. There were already two ladies in residence at the time. One wanted to mother him and the other wanted to kill him. I thought it would be a good while before Spike would grow enough to hold his own. He grew strong and quick but as for holding his own; he never really did that until after "The Queen" departed. By then he was just a fat, lazy, happy kitty. Back in those earlier years, my beliefs toward cat food was just that—cat food, the dry, hard stuff like Purina Cat Chow®. A few years back I'd learned my lesson with our first little kitty who, once she got a taste of canned cat food, refused the dry. This made for two problems. One, my budget for my pets could only extend so far, and two, it made for a more aromatic offal in their catbox when compared to the dry. After nearly a weeklong hunger strike, "The Queen" gave in. From then on I swore there would only be dry cat food in the house. If that cat had only known how close I'd been to caving then she'd have held out. But then, she's in kitty heaven alternately laughing at me and hurling insults over my current actions. Once the ladies had passed on, Spike was alone. By then he was passed his prime and was being supremely coddled. He'd also begun losing his canines. Therefore soft, canned cat food which had recently begun creeping back into his diet—became his diet. It began with the regular Friskies®, 9Lives®, and even the Alpo® for cats. Spike found a few that he liked, mainly the turkey and tuna, and turned his nose up to the rest. I found I had to be quite careful in my cat food selections because if Spike didn't like it, out it went. Our two younger felines still prefer the dry but now I buy Dental Diet® and Hairball Formula® (gotta watch their teeth!). Then it was to fancier brands—Fancy Feast® the pate kind. Spike won't touch anything "shredded or minced or roasted" and for a short period would only eat one kind. Then he turned his nose up to that too. I kept trying to reintroduce some of the old stuff along with what he would eat—just to keep the variety going. Spike wasn't about to be tricked by that. Eventually we got to the point about a year ago when there was NOTHING in the cat food aisle at the grocery store he would eat. Then I opted to try the Pet Smart® store—they had just opened up so Spike was lucky. I found all types of new brands of cat food to try out and waste money on. One week that I'd buy just two of an item—then that would be all he wanted. When I came home the following week with a slew of it—he would just sniff at it, look me in the eye, and meow pitifully as to say, "You expect me to EAT this stuff?" For a woman who swore that I'd only invest in dry cat food, I'm well beyond hearing "I told you so" from The Queen herself. We are now to the stage I buy roast beef from the deli—the good stuff—and chop it up in tiny little pieces for him. We've gotten beyond regular "chunk style" tuna in water to "Albacore" tuna—he prefers Bumble Bee® to Star Kist®. At no time can I stand in the kitchen in the main spot where I prepare food without the entire pack descending on me plaintively announcing their ravening bellies. What group of little liars. Still, at least they let me know they are there so I can try really hard not to make a movement that could end in a cat's scream and me being frightened to death. I swear they all try to stick their tails under my feet so they can be trod upon and I will feed them something special to make it up to them. They know this and I know this. This is the same reason I'll stand there like my feet are glued to the floor. I lean a lot. Spike taught them both all he knows. Stinky and Pye are also apt pupils under his tutelage. He's old enough to know all the nuances. He won't come running when I open the fridge door—unless he hears the cold meat tray slide open. Likewise, he won't arrive howling at the sound of the can opener unless it's something good. I've never known him to show up when I was opening a can of diced tomatoes or asparagus tips. As far as people food goes, Spike's still finicky. He likes a good ham and a little pot roast. He loves turkey but is only okay with chicken. However his latest thing, something out of which desperation has grown, is the "canned" chicken by Hormel®. He loves it. If you are wondering why I do all this then you are no pet lover. Spike is old now and has been steadily losing weight over the course of the last two years and is downright bony. He eats as well as I can feed him. For him, I'd open another thousand or so cans of whatever he'll have just so long as I can keep him around.